The peculiarity of the Orano Bar Restaurant Pizzeria and Beach Resort is his particular position. The dunes of Lacona in which it is immersed, the Mediterranean vegetation that surrounds it and the century-old pine trees make the environment cool and relaxing. The beauty of our Beach Resort is that you can eat in the open-air, watching the sea with your feet in the sand. The restaurant pizzeria bar is open all day for both lunch and dinner and it has a menu suitable to satisfy any appetite. The menu is run by chef Francesca, who harmoniously blends traditions of our Elba Island and Sardinian imagination with high- quality ingredients. Main and second courses come out of our kitchen as far as the eye can see. All our courses are simple and express, depending on the season and what the sea offers, believing that a fresh ingredient is already a good starting point to make an amazing dish. 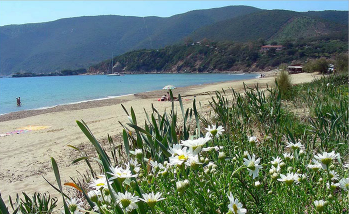 At the Orano Beach Resort, in addition to fish and meat, it is possible to savour fresh caught fish cooked on the grill, pizza, but also the traditional “Elba schiaccine”, salads and cold dishes, or just a coffee or an ice cream. In the evening, the terrace directly overlooking the beach, offering all the splendor and relaxation of the sea. It is perfect both for people seeking a quiet and romantic angle, and for families who have the chance to enjoy dinner while their children are playing on the beach a few steps away from them. We are open from April to November. Lacona is the last beach of the Tuscan Archipelago and one of the few in Italy where you can see an extensive dune system..